Ready for big Thank You fun? It’s so big it takes two hands to hold it! Imagine an enormously delectable, Belgian milk chocolate, hand-dipped fortune cookie with mini primary color confetti smiley faces and Thank You balloons. 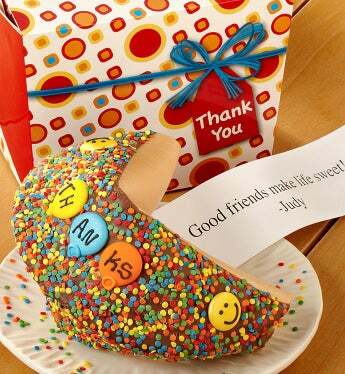 Plus, nestled inside the cookie is a large personalized fortune from you – it’s sure to be a big hit. Caution: They might not share! Ready for big Thank You fun? It's so big it takes two hands to hold it! Imagine an enormously delectable, Belgian milk chocolate, hand-dipped fortune cookie with mini primary color confetti smiley faces and Thank You balloons. Plus, nestled inside the cookie is a large personalized fortune from you – it's sure to be a big hit.Please note that the personalized message comes from the card message you enter towards the end of the checkout.